Summary: A recent survey on banking customer decisions provides thought-provoking information for community banks. National Geographic indicates the praying mantis lives about 1Y in the wild and goes by the scientific name mantis religiosa. 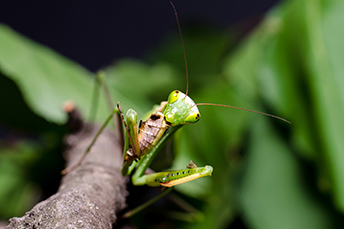 These tough insects known as mantids can also turn their heads 180 degrees to seek out prey. We all know they have two large compound eyes on the sides of their head, but you probably don't know that there are another three simple eyes located between those big bulbous babies. In this rapidly changing industry, it is always good to know what the bank customer experience is, in order to address any service gaps and drive customer retention. Of course, community banks are already masters at this. But, we thought the results from a survey on US banking consumer decisions, conducted by research firm, Ipsos, were pretty interesting, so today, we wanted to share some of them. According to this October 2017 survey, for the most part brick and mortar banks are doing a pretty good job on customer service, with 96% of Americans noting that they are satisfied with their banks. Of that number, 71% even said they are extremely happy with their banks, while another 25% said they are happy. This seems pretty rosy, so it appears the efforts of many banks to address their customer needs more succinctly is working. Not surprisingly, however, in an increasingly digital industry, customers have very little patience. In fact, 48% of customers think that it is unreasonable if they have to wait five minutes or more for service. Unexpectedly, despite the fact that millennials are more tech savvy and self-reliant than older generations, they are also the most patient when it comes to getting service in a bank branch. Forty-five percent of millennials indicated that they believe waiting up to 10 minutes to be helped is reasonable, compared with only 37% of customers age 35 to 54, and only 32% of customers age 55 or older. However, this doesn't mean that millennials aren't willing to change banks when they feel their needs aren't being met. While one in five Americans say they have switched banks because of what they perceive to be poor customer service, one in four millennials have switched banks in recent years because of this reason. Of course, community banks have less to worry about here than their larger peers, as they often get high marks for customer service. Lastly, the survey touched on customer security perceptions. Where brick and mortar banks still have a slight edge over digital-only banks is in the level of comfort with the security of the transaction. A whopping 98% of respondents indicated that they feel secure conducting transactions in person at a branch, compared with 92% of respondents who are comfortable doing so online and only 85% who are comfortable doing the same transaction using a mobile phone. The presence of video surveillance is one of the main factors cited, with 90% of respondents saying that they feel more secure when they see a video camera present. This survey may not be ground-breaking, but it shows community banks that some of the things they do best - keeping customer service levels high, streamlining branch transaction times where possible, and making your customers feel safe in your branches - are paying off with bank customers. We thought that was worth sharing. A BI Intelligence survey of global senior bankers finds the biggest challenges are: profitability (19%), regulation (17%), satisfying customers (17%), competition (15%), data (15%), cybersecurity (10%) and other (7%). The Fed is warning bankers that fraudsters are using stolen tax information to file fraudulent tax refunds. These are then deposited into a stolen client's account, and then moved to a cybercriminal posing as an IRS agent. The fake agent informs the client that the refund needs to be returned. Banks should be aware of this as the tax season progresses and warn their customers. Macroeconomic Advisers has been named the most accurate economic forecaster of 2017 by the Wall Street Journal. They forecasted 3 rate hikes, 4.3% unemployment at year end (actual 4.1%), annual GDP at 2.3% (2.5% actual), headline inflation 1.9% (1.7% actual) and core inflation at 1.7% (1.5% actual). RBS subsidiary NatWest is testing an AI-driven "digital human" called Cora, which will answer simple banking questions and free up banker time. This would be an advanced version of chatbot Cora, which is currently having about 100,000 discussions per month. PwC found that fraud or economic crimes reported in the past 2Ys were more often committed by people within an organization - 43% vs. 29% for 2016. Keep your eyes open and keep testing your processes to stay safe.